Many special effects that were difficult (and time consuming) are simple to achieve with a single tool. One stroke is all it takes to make multiple fine lines with these angled brushes. 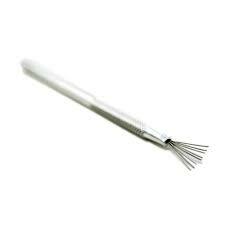 The heat-treated steel bristles are firmly set in a firm grip, textured aluminum handle for a total length of 5″.